Crock-pot Chili is one of my favorite dishes to make during the winter months. This recipe is so simple to make; no need to precook anything except for the meat! And, it’s easily customizable–use any variety beans, omit / add vegetables as you desire, and use up the open jar of spaghetti sauce on hand. I like to use two different kinds of beans in the chili for variety; typically a dark red kidney bean and a can of black beans. I also add a variety of vegetables to the crock-pot chili–this is a good way to use up extra veggies on hand as well as add in loads of anti-oxidants. If you’re not keen on chunky-style chili but want to add in extra nutrients, try shredding them rather than chopping. If you have a picky eater in your family, shredding vegetables is a great way to disguise them, as they often melt right into the dish! My favorite part of our crock-pot chili is the added sweetness from the brown sugar, cinnamon, and corn. Recently I had a cup of traditional chili at a covered-dish luncheon and was surprised at how bland it tasted in comparison. This recipe relies more on beans and vegetables and is very light on meat, which is quite different from traditional recipes. Although crock-pot chili is relatively healthy, keep an eye out for excessive sodium lurking in the canned ingredients. When possible, opt for low-sodium beans, and be sure to rinse them thoroughly to remove excess sodium. When choosing diced tomatoes and canned corn, look for no-sodium added or low-sodium varieties. Spaghetti sauce can be another high-sodium item, be sure to pick-up a heart healthy jar. Brown ground beef or ground turkey. Drain fat. Place cooked beef and all chopped vegetables into slow cooker. Rinse beans to remove all excess sodium and add to slow cooker. Add corn (drained), tomatoes, pasta sauce, and all remaining ingredients. Mix well. Cook on low 6-8 hours. Enjoy! Here in the northeast, we’re expecting snow and below-freezing temperatures the rest of the week. 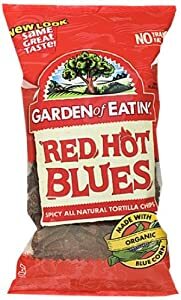 I’ll be firing up my crock-pot with a fresh batch, and serving it with Garden of Eatin’ Red Hot Blue Corn Chips. Give it a try, and let us know what vegetables you added!